If you want to get a project done, be sure everyone introduces themselves. We say this because research from China finds cooperation increases when people know each other's names. Testing found that when people did not know each other's names they would cooperate to solve a problem only 25% of the time vs. 50% to 75% if they knew the other person's name. If you want to drive more cooperation on bank projects, use this as a little tip to break the ice before starting any meeting. This technique is a good one to use when seeking business opportunity with customers as well. Getting to know small business owners helps ensure you can capture loan opportunities as you help bolster their financial success. 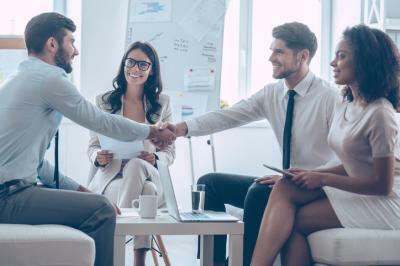 For potential customers on the edge of the banking system perhaps, the CFPB has announced it is considering ways of helping borrowers who may not yet meet current underwriting standards. In Feb, the CFPB said it would begin accepting comments about allowing banks and other lenders to use non-traditional or unconventional financial data when assessing a borrower's creditworthiness. This could be good for banks or it might also increase regulatory risk, so be sure to monitor the public responses. The CFPB will be accepting comments on the change through May 19 through its Request for Information process. We note that while the main focus is on consumer lending, it could also impact how banks use similar data in making small business loans. Bankers wondering how well such alternative sources might work may want to consider input from LexisNexis. It says lenders can benefit by combining traditional credit data with alternative data. Among the questions you can answer by doing so could include such things as: whether the company is up-to-date and in compliance with state and local agencies; how long has it been at its address; whether it owns property and/or assets; whether there are any liens, judgements, bankruptcies or sanctions involving the company or the owners and others. Community banks could also incorporate personal credit history of the type being studied by the CFPB. This could include information on the business owner's residential occupancy history and utility payment history. LexisNexis says that by combining a broad range of data sources, including both traditional and alternative sources, lenders would wind up with a much larger pool of small business owners who meet acceptable credit risk standards. In fact, TransUnion indicates their credit model usually increases the number of creditworthy applicants by 20%. Some lenders have already started employing alternative credit data in their deliberations, as others remain concerned about the potential regulatory whiplash if they do so. If the CFPB decides to endorse and set standards for the use of alternative credit data in consumer loans, the acceptance of these data points could become far more widespread. That could be good for community bankers, as it would potentially benefit both the bank and small business owners around the country. As you get out in the field and introduce yourself to potential and existing customers you might want to think about how this regulatory shift may help. That could be good news for you and for small business owners. Yields pushed up 4bp after the Fed ignored Q1 economic weakness and commentators continued to project a June rate hike. Novantas reports about 60% of corporate liquidity is sitting in low or noninterest bearing deposit accounts vs. only about 28% back in 2000. This is one reason regulators keep telling banks to be prepared for potential runoff in such balances as rates continue to rise. A Korn Ferry survey of CIOs finds the main reasons a CIO gets fired are inability to work well with or influence others (40%), difficulty meeting goals on time and within budget (32%), inability to align the organization around a change agenda (18%), inability to exhibit the courage to challenge the status quo (5%) and inability to cope with ambiguity (5%). Fed research on small businesses finds the following application rates for borrowings by type: business loan (51%), line of credit (41%), SBA loan or line of credit (23%), auto or equipment loan (15%), personal loan (14%), cash advance (9%), or mortgage loan (7%). The National Association of Realtors reports Q4 2016 home prices climbed 5.7% YOY, as supply dipped to its lowest level in 18Ys (1999). Infusionsoft research finds content used most often by companies to capture customers includes: posting on social media (68%), sending emails (43%), publishing blog posts or articles (34%), sending direct mail (24%) and creating videos (23%). Research by Thrive Analytics finds the biggest challenges small business owners say they have with digital media are: not enough knowledge or expertise (47%), not enough time (43%), advertising budget not large enough (30%) and not enough resources (26%).